Anya Alstreim is Knight of Six in the Knights of Rounds and pilots the heavy assault Knightmare Frame, Mordred. She is a quiet and reclusive person with a mysterious past and has a Britannian emblem tattooed on her left arm. She holds the distinction of being the youngest individual ever appointed to the Knights of Rounds at the age of 15. She wants to be remembered, so she maintains a blog which she frequently updates with pictures she takes with her camera-phone. 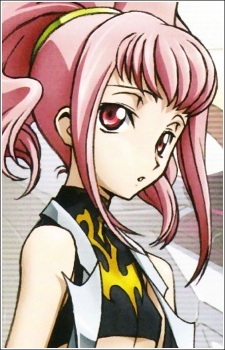 As one of the younger members of the Kights of Rounds, she is close friends with Suzaku Kururugi and Gino Weinberg. Suzaku's cat Arthur also takes a liking to her, though it seems to be more affectionate to everyone except Suzaku himself. Anya maintains a detached attitude in most situations, usually declaring most things to be boring. In battle, her fighting style reflects her heavily-armored Knightmare; she annihilates her enemies with overwhelming force and doesn't hesitate to kill disabled enemies. However, this detached attitude also gives her a lack of common sense; she had piloted her personal Knightmare Frame just for the sake of capturing Lelouch’s hat to gain extra club budgets, disregarding the fact that she was piloting her Mordred in a non-combat area and had aroused the suspicion of the Knight Police, as well as forgetting the fact that she is to be a couple with Lelouch if she gets his hat. It is later revealed that she updates her blog because she doesn't trust her own memories, as she has numerous blog entries over nine years old which she doesn't remember writing as well as discrepancies between her blog and her memories. Suzaku speculates that she is under the influence of Geass. It is explained that these occurrences are being caused by Marianne, whose spirit has been lying dormant within Anya. Marianne takes over her body as a means to reach Charles, eventually leaving Anya's body. She faces off against Jeremiah Gottwald and manages to destroy the outer body of the Sutherland Sieg. However, Jeremiah uses the Sutherland stored inside in a kamikaze attack, which heavily damages the Mordred. He is prepared to kill Anya, but when she makes mention of having no memories, Jeremiah realizes that she is under the influence of Geass and restores her memories. In the epilogue, the two are seen tending to an orange farm together.